During my journey through the musical landscapes served up by this Swedish retro outfit, I couldn’t quite shake the feeling that the music was somehow familiar. Not because this is actually quite an old album, but because there are bits and pieces of the bands that I already mentioned as well as a healthy dose of leaden Black Sabbath riffs mixed up with some bluesy licks and solos. 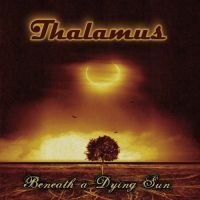 But Thalamus succeed in taking all of these influences (for influences they surely are) and mixing them up into a stomach punching brew that is entirely their own. This is 70’s groove with the intensity of modern day metal. It is a mixture of heavy riffing and powerful singing courtesy of Kurt Sjöström delivered with an overwhelming intensity found almost exclusively in ‘new’ bands like this who just let it rip in an attempt to claw their way from obscurity to the centre stage and some much deserved recognition. And let me tell you: they rock! Tracks like Can’t Live Without Your Love, Ride, We’re Gonna Die Someday and Maze of Revelations are superb examples of how to make metal heavy enough to make the hair on your scrotum curl up and die, yet with clear and powerful choruses that you desperately wish you had the voice to sing along to. One might argue that the album would have been stronger if it had been trimmed a bit and one or two tracks had been left out (55 minutes is quite a long running time considering that variation might be one of this band’s few weaknesses), but I just can’t tell which track(s) should have been left out – doesn’t seem to be any fillers. Also, the hushed closing track Falling is almost (but not quite) too close to being a cover of Sabbath’s Planet Caravan for their own good, although the swirly keyboard in the background also makes me think of Captain Beyond and their Starglow Energy. Still, it’s a perfect way to end the album, so who am I to argue? All in all, I would highly recommend Beneath a Dying Sun to anyone who likes metal with a 70s flavour.